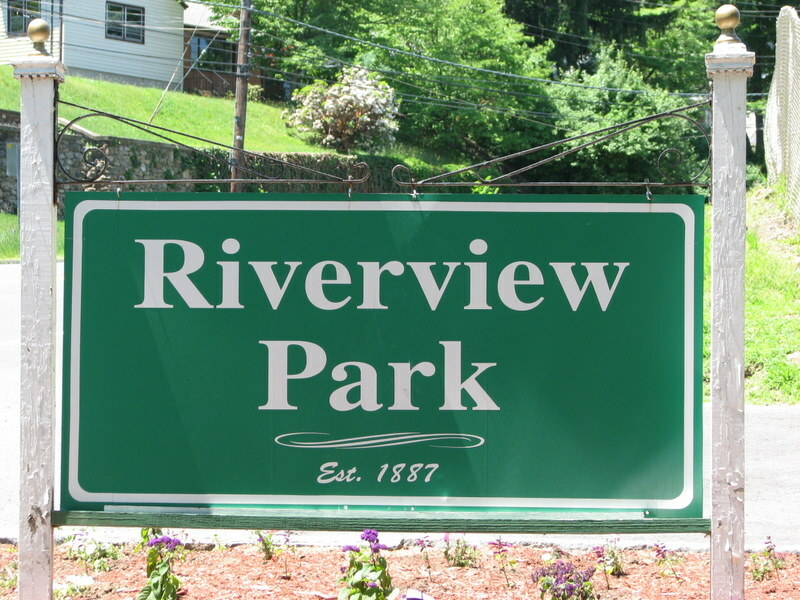 The City's first park, located on the northern edge of downtown Shelton, has been a major attraction for many years. The playground and baseball fields bring the greatest number of visitors to the park, many of whom are not aware of nearby features such as the hiking trail, Constitution Oak, or Pootatuck Indian rock. Scenic features at the park are listed individually below. See map. Attributes: VIEW - Ousatonic Dam overlook. 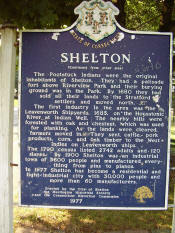 HISTORY - Oldest park in Shelton, historic markers, site of Pootatuck Indian fort. PARK - Ammenities include playground and ballfields. 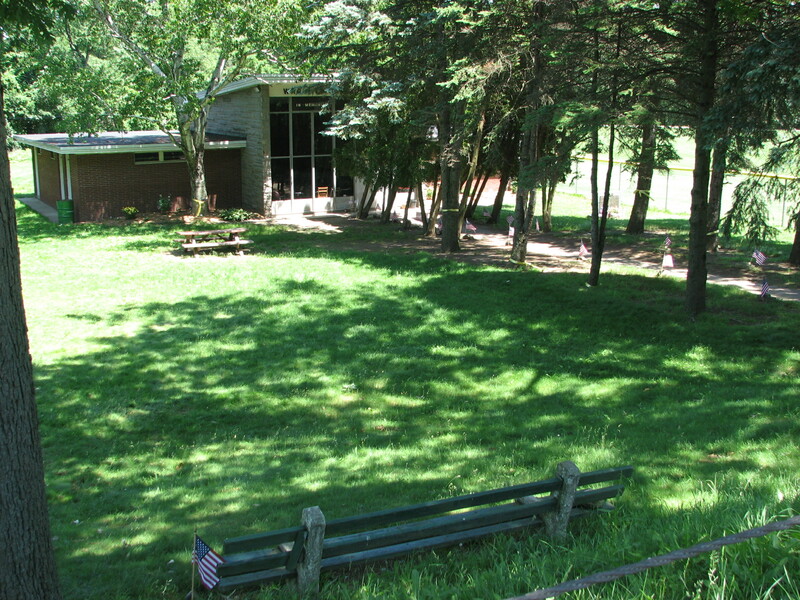 PUBLIC RECREATION - Playground, baseball, basketball, hiking. SPECIMEN - Constitution Oak. FEATURES - Listed below. AT RISK - View of Ousatonic Dam may be impacted by proposed removal of gatehouse for a fish ladder and filling of canal for development. 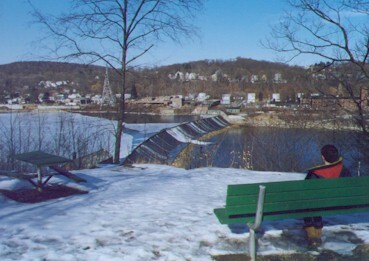 A scenic overlook of the Ousatonic Dam is maintained alongside the park access road. People once lined the banks of the park to watch Yale rowing races, but the trees now obscure much of the view. A bench and picnic table now mark the location. Attributes: VIEW - Ousatonic Dam Overlook. HISTORY - First park, historic dam complex. PARK - PUBLIC RECREATION - Picnicking. FEATURE - Dam. AT RISK - - View of Ousatonic Dam may be impacted by proposed removal of gatehouse and filling of canal for development. Located next to the scenic overlook on the park access road. 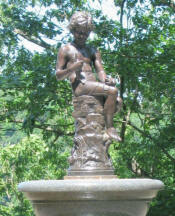 The statue has been at the park for over 100 years and was recently refurbished. It was originally used as a watering trough for horses. Attributes: HISTORY - Over 100 year old statue. SPECIMEN - Good example of era statuary. "Fort Hill. On this point of land the Pootatuck Indians built a Fort in 1673 to prevent the white man from coming up the Ousatonic River." The stone was prepared by The Daughters of the American Revolution. "This is a Constitution Oak presented to Riverview Park 1902 by Senator Sturges Whitlock, Delegate to the Constitutional Convention. This marker placed 1934 by the Kiwanis Club of Shelton." 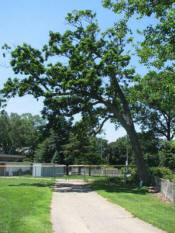 Constitution Oaks are direct descendents of the Connecticut Charter Oak, which blew over in a storm in the late 1800's. The War Memorial Building is located between the two ball fields. A walkway leading from Howe Avenue to the War Memorial is lined with memorials and flags, a picnic table and a park bench. The largest memorial is for the men and women from Shelton who died serving in WWI, WWII and the Korean War. In 1976 the state's Historical Commission gave identical cast-aluminum and enamel historic markers to each city in the state to mark the nation's bicentennial. Shelton's marker is located along Howe Avenue near the ballfields. 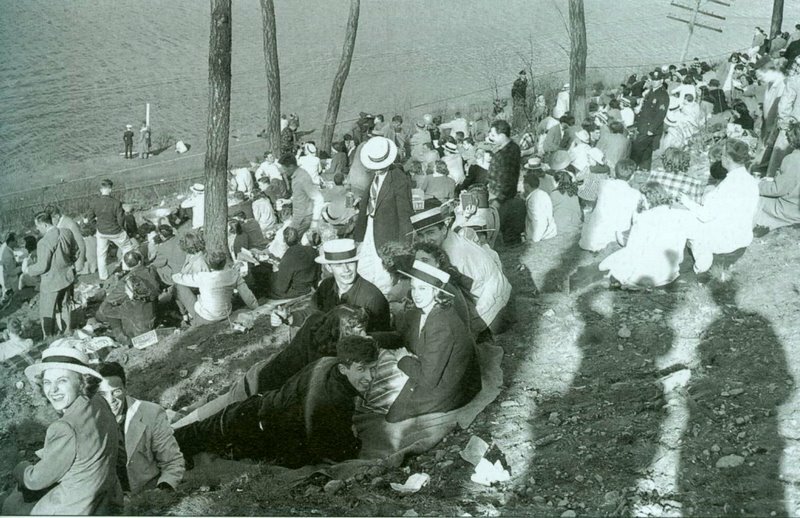 The Riverview hillside opposite the Yale Boathouse (located in Derby just north of the dam) once provided a popular vantage point of the rowing races (see historic photo). The bank is now heavily forested, providing only limited views after the trees have lost their leaves. A substantial hiking trail cuts along the hillside. Judicial pruning might renew the vista. However, care must be taken not to spoil the view of the wooded slope as seen from the river, or to cause erosion of the vulnerable hillside.